If you have watched the most recent Avengers movie, then you would be aware of a scene where all the superheroes Iron Man, War Machine, Hawkeye, and Captain America take turns to lift Thor’s hammer but fail. Someone has an explanation, Why? 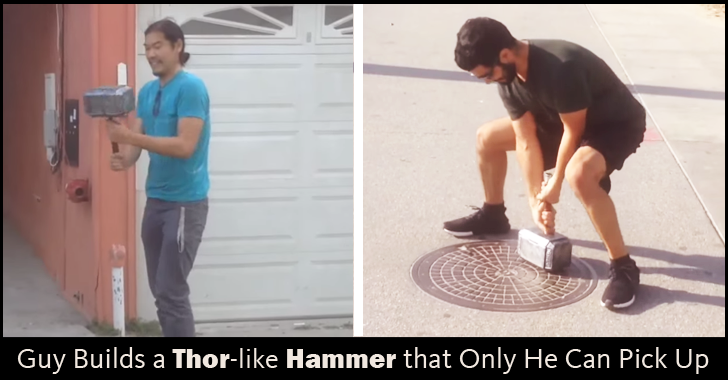 Inspired by Thor's legendary hammer Mjolnir that is not liftable by anyone except Thor, an electrical engineer has built a real-life Mjolnir that only he can pick up. Electrical engineer Allen Pan, who also runs the Sufficiently Advanced YouTube channel, created a giant hammer that only he can lift, so long as the hammer is on a metal surface. An Arduino Pro Mini and a solid state relay, which serves as a switching device. A microwave oven transformer electromagnet that uses electricity to produce a very strong magnetic field. The electromagnet creates a very strong magnetic field, strong enough that when the hammer is placed on a metal surface, it feels too heavy to lift. With only a little bit of programming, Pan made the fingerprint sensor act as a switch — so when he grabs the hammer's handle and places his thumb on the sensor, the electromagnets turns off, allowing only him to lift the hammer. When he moves his thumb over the sensor, the magnets switch OFF again, allowing nobody else to lift the hammer, except Pan. "The handle is imprinted," Pan says, suggesting that "whosoever carries Thor's fingerprints" would be able to lift it. You can also watch the YouTube video, in which Pan tricked a bunch of people into trying to lift the hammer, but the only guy who finally lifted the hammer was him.